One interesting aspect of a job guarantee, from an analytical perspective, is that it introduces an endogenous element to government spending. The government’s spending on the program will adjust automatically to variations in the number of people who accept the standing offer of a job. These variations will reflect employment fluctuations in the broader economy. Government spending will respond directly to employment fluctuations, and only indirectly to variations in income. Given the level of autonomous expenditure (including the exogenous component of government spending) and the size of the expenditure multiplier, the overall level of government spending will depend on the rate of take-up of job-guarantee positions. Any endogenous change in government spending, linked to variations in job-guarantee activity, will have a multiplier effect in the broader economy that will then react back on the rate of migration between the two sectors as some workers respond to changing employment conditions in the broader economy. But this, too, by causing a change in the endogenous component of government spending and the accompanying multiplier effects, will create further feedback. The feedback effects between the job-guarantee sector and the broader economy will go back and forth, but their impacts will get smaller with each round of effects. This means that, in principle, it is possible to find a level to which government spending would converge, given the values of various parameters and exogenous variables. This is the present focus. Let Yb and Yg be the levels of output produced in the broader economy and job-guarantee sector, respectively. The economy’s total output (Y) will be the sum of output produced in the broader economy and the job-guarantee sector: Y = Yb + Yg. The main task is to find an expression for endogenous government spending Gg. This will also suggest an expression for total government spending G.
The amount the government spends on the job guarantee (Gg) will be equal to the level of employment within the program multiplied by the cost of running the program per unit of employment. The first factor, the level of employment in the job-guarantee program (Lg), is equal to LF – Lb. To characterize the second factor, the cost of the program per unit of employment, let wL represent the living wage paid to job-guarantee workers per unit of employment and recall that ϕ is the share of wages in the total cost of the program. This makes the fraction wL/ϕ the cost of the program per unit of employment. The level of employment associated with full employment (LF) is exogenous, determined by workers themselves. The living wage (wL) and wage share in costs (ϕ) are also exogenous. The living wage is set by government. The wage share in costs depends on the living wage, the prices government agrees to pay for equipment and materials, and the production techniques employed. Expression (12) can be used to calculate the level to which government spending converges given particular choices for autonomous spending (G0 and A’), the level of employment corresponding to full employment (LF), the marginal propensity to leak (α), productivity in the broader economy (ρb), the living wage (wL) and the wage share in job-guarantee costs (ϕ). Alternatively, expression (11) can be used to calculate the level to which government spending on the job guarantee converges, given the values of the same parameters and exogenous variables, with the level of Gg then added to G0, the amount of autonomous government expenditure. Productivity always has a social determination. In the case of private-sector production, this point is often lost, because the social determination is played out through social institutions such as the market that many people come to see as natural. However, market outcomes depend, among other things, on distribution, which strongly influences the composition of demand and hence the composition of output and employment as well as the types of production techniques that are developed. This determination of productivity is, in principle, democratic, based on “one person, one vote”, as opposed to the market, which is democratic only in a much more limited degree, characterized as “one dollar, one vote”. For instance, the market would deem the provision of health care to the poor as of zero productivity unless somebody with private means happened to be willing to pay for it, since the poor lack the means to pay out of their own private income. Yet, if the poor were gifted income or received a transfer payment sufficient to pay for health care, the market would suddenly deem the same activity as having positive productivity. A market assessment of productivity can only be valid to the extent that the distribution of income and wealth is legitimate. More generally, a market assessment of productivity is only valid to the extent society as a whole deems it to be valid. Even leaving aside distribution, markets often perform poorly due to externalities, public goods or coordination failures. If, for whatever reason, the social consensus is to reject the market’s verdict on the productivity of an activity, then it is the market’s verdict that is to be rejected. Under a job guarantee, as in public-sector activity more broadly, society would take a more direct approach to the assessment of productivity. Defining productivity in the job-guarantee sector as ρg = Yg/Lg carries the implication that job-guarantee productivity equals the living wage (wL). This makes clear that the setting of the living wage is a direct social evaluation of job-guarantee productivity: ρg = wL. This expression shows that the initial impact of government spending on the broader economy is different, depending on where the spending is directed. A dollar of autonomous expenditure (A = A’ + G0 = C0 + I0 + G0) has its initial impact on the broader economy. If it were not for the job guarantee, this expenditure would have a multiplier applicable to the broader economy of 1/α. However, an increase in autonomous expenditure, by adding to demand, output and employment in the broader economy, causes a contraction in the government’s job-guarantee spending (because A enters the expression for Gg). This moderates the multiplier impact of the autonomous spending. As a result, the full multiplier on autonomous spending will be smaller than 1/α. The fraction in this last expression is the multiplier already obtained from (7). A simple numerical example may assist with understanding. The purpose will be to find the total level of output and the division of output and employment between the broader economy and the job-guarantee sector. Consider an economy for which full employment entails the employment of the equivalent of 10 million full-time workers. To keep the numbers small, define a unit of employment as the annual hours worked by 100,000 full-time workers, or one percent of the labor force. Full employment then entails L = 100. Also, define a unit of expenditure (or unit of income) as $8 billion (equal to the unit of employment multiplied by the average annual wage in the economy as a whole, assumed to be $80,000). An expenditure of 2.5, for instance, represents expenditure of $20 billion. Here, A is total autonomous expenditure, including autonomous government spending. That is, A = C0 + I0 + G0 = A’ + G0. Suppose, initially, that the level of autonomous government spending is 60 and private autonomous expenditure (A’ = C0 + I0) is 28. Putting A = 88 into the formula gives Gg = 6. 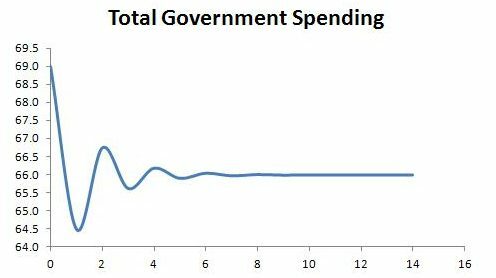 Total government spending (G) will converge on G0 + Gg = 66. Since average productivity in the broader economy is 2, employment in the broader economy converges on Lb = 92, with the remainder of employment (Lg = 8) in the job-guarantee program. With 8 percent of employment located in the job-guarantee sector, there is plenty of room for government to lift its autonomous spending. The multiplier effects of this will result in an expansion of activity in the broader economy and a contraction in job-guarantee employment and production. For instance, if autonomous government expenditure were increased by 6 to G0 = 66, feedback between the broader economy and job-guarantee sector would result in a reduction in job-guarantee spending of 3 to Gg = 3 and an increase in total government spending of 3 to G = 69. Total output would rise to Y = 194. 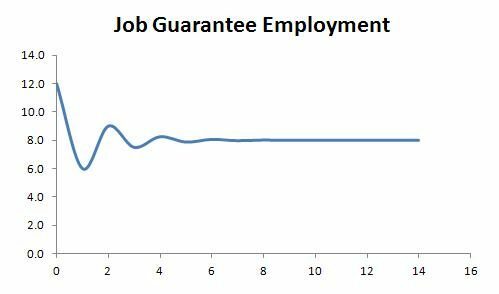 Job-guarantee output would contract from 4 to 2 and output in the broader economy would increase from 184 to 192. Employment in the broader economy would increase to 96, whereas employment in the job-guarantee sector would contract to 4. Understanding might also be enhanced by looking at the first part of the previous example in a different way. We can think in steps from initial autonomous acts of spending through to their multiplier effects, the automatic response of endogenous government spending, and the subsequent feedback between the broader economy and job-guarantee sector. The sequence begins with government, firms and households autonomously spending 88, of which 60 is autonomous government spending. If it were not for the job guarantee, the expenditure multiplier (1/α) would be 2 and the full effect of the autonomous expenditure would be felt in the broader economy. So, the autonomous spending of 88 would notionally result in output of 176 in the broader economy. Since average productivity in the broader economy is assumed to be 2, this 176 of output would correspond to employment of 88. But, of course, there is a job guarantee. Employment of 88 in the broader economy would mean employment of 12 in the job-guarantee program because of our assumption that workers, through their labor-supply decisions, determine full employment to be employment of 100. Notionally, this would imply an amount of government spending on job-guarantee production of 12wL/ϕ = 9 (since we set wL to 1/2 and ϕ to 2/3). But this endogenous government spending of 9 would result in further demand for output produced in the broader economy. Of the 9 spent by government on the job-guarantee program in the initial stage (row zero in the table below), one-third (equal to 1 – ϕ) will immediately enter the broader economy. The other two-thirds (the fraction ϕ) will be received as wages by job-guarantee workers. As already discussed, the multiplier on this spending applicable to the broader economy is 1/α – ϕ, which in the current example equals 1.33. As a result, the change in income that would result from the initial job-guarantee expenditure of 9 will be 12. This is shown in the column labeled ΔYb. The change is entered in row 0 because the basis for its calculation is in that row. But the change in income registers in the following round of the process (round 1), as can be seen in the column labeled Yb. In round 1 (the second row), the endogenous government expenditure of 9 has caused an expansion of employment in the broader economy and a contraction in the job-guarantee sector. This results in a reduction in endogenous government expenditure, which halves from 9 to 4.5. This negative change sets off a negative multiplier effect on the broader economy, with the relevant multiplier once again 1.33. The table summarizes the feedback effects and illustrates the convergence of total government spending to G = 66, endogenous government spending to Gg = 6 and other endogenous variables to their respective values. The convergence of total government spending to G = 66 and job-guarantee employment to Lg = 8 can also be represented graphically. Like many MMT claims, that should be prefaced with “if MMT were dictator ….” Any real life job program will not pay a living wage. Will not be open to all takers. Will have restrictions on hours worked. And so forth. Sounds like sophistry to me. There is no guarantee that a JG would have any real productivity. There is no guarantee that a JG would have any real output. It’s like saying the output of the U.S. military can be measured as the military budget. Well, it does contribute to GDP but a lot of non-real things contribute to GDP. Some parts of our economy, like the military, produce “bads” rather than “goods.” GDP is a measure of activity, yes, but not a measure of society’s wellness. Nonetheless I understand that you were making simplifying assumptions in order to arrive at a mathematical model for what I would call a “step function” for the imaginary MMT JG. Likewise one could model a step function for an means-tested BIG, or for a payroll tax rate that is indexed to the employment rate. That depends on the power profile in the area determining the system. I live in a country with a health service that is open to all takers and has no restrictions. So to say such a social system cannot be constructed is to assume that the rest of the world’s political systems are as degenerate as the USA. They are not. Productivity is determined in social terms. If a disabled person takes all week with four helpers to move one brick from point A to point B and that is what that person wants to do, then society sees that as performing at the best that person can do for which they will receive the living wage. If somebody is seen as doing their best for others they will receive from the community the means to a decent life. Because that’s pretty much the definition of community. The MMT view shows that market value has nothing at all to do with social value. Certainly market value has little to say in determining social value. Most of the output of the private service sector has no real output of any actual social value. But the activity keeps people engaged during the day and those working all hours to run the machines that produce the actual stuff we need are happy with the trade off. What you’re missing, I think, is that wider society wants to see you give up hours for the benefit of others. If you agree to do that then you receive a share of the output of the massified, specialised production system – even if what you do is, on a wider philosophical analysis, largely pointless. It has to be like that otherwise those on Wall Street would never eat. This is a ridiculous, preposterous idea. It does not follow in the least from the assumptions of the model. If you wish to assume that the JG wage would be a non-living wage, then so be it. It will be whatever it is set to be, and no more. Plug that number into the equation, and the rest works. Arguing over whether JG work would entail any REAL GOOD productivity is scholastic. It will amount to effective, unit-of-account-denominated production and productivity, whatever happens to be the ‘ethical’ evaluation of the resulting output. I daresay that, ethically, anything will be more of a ‘good’ than exogenously enforced, involuntary unemployment. A much simpler approach is via the NET marginal propensity to leak. With this approach it is easy to derive much simpler results for other variables. Hi Kingsley. Thanks for your input. There may well be an easier way to do it. But, at least as you describe it, the approach in your comment doesn’t seem to work. Using the example from the post, productivity of 2 in the broader economy would mean that a one unit decline in broader-economy output would cause a reduction in employment in the broader economy of 0.5, implying u = 0.5. The government spends 0.75 for each additional unit of labor employed in the job guarantee, implying z = 0.75. So your alpha prime would be 0.5 – 0.5(0.75) = 0.125, giving a multiplier for the broader economy in your version of expression (5) of 8 rather than 1.33. Also, the effect of job-guarantee spending cannot be treated in the same way as welfare, because job-guarantee spending directly enters the economy. In the example, one-third directly enters the broader economy and two-thirds directly enters the job-guarantee sector. At least some (and probably a lot) of private sector activity/output, which includes externalities, not only is low in social value or even devoid of it, but also is anti-social, especially when considering externalities. This was less noticeable when “the solution to pollution is dilution.” Now that is over as organizational complexity increases with population growth and ecological consequences become evident. This is a dark side of economic liberalism manifesting as “capitalism,” that is, prioritizing ownership (capital) over people (labor) and the environment (land). Is it a fair takeaway to read that as just another way of saying it’s counter-cyclical? Like taxes, social safety net spending and other fiscal automatic stabilizers? It is certainly counter-cyclical like other automatic stabilizers, but works through endogenous changes in government spending. The tax multiplier is smaller, equal to (1 – alpha) / alpha, because unlike a change in government spending, a change in taxes (including a change in transfers treated as negative taxes) does not have a direct impact on output. The first impact on output of a welfare payment, for instance, is not felt until welfare recipients spend a fraction (1 – alpha) of the payment. Also, the job-guarantee mechanism would be directly linked to employment outcomes and changes in the labor force rather than income. That is, job-guarantee spending would be directly responsive to what happens to the composition of employment between the broader economy and job-guarantee sector (as well as to changes in the size of the labor force), and only indirectly related to what happens to income. In contrast, an automatic stabilizer built into a tax-transfer mechanism is directly responsive to variations in income rather than employment. The fact that a job guarantee would be directly responsive to variations in employment composition and labor-market participation rather than income variations is what makes it effective at maintaining full employment in the sense defined in the post. Peter, it is possible that I am making a blunder somewhere, in which case please ignore this comment. In the post you seem to use equation (7) to conclude that the multiplier ∆Yb/∆A = 1/ α = 1/(1 – c +ct). Your reasoning seems to assume that Gg (govt expenditure on the JG scheme) is unchanged when A changes. But Gg is endogenous and would change, and this needs to be allowed for in the formula for the multiplier. As I suggested in my earlier comment, the Keynesian multiplier is ∆Yb/∆A = 1 /α’ = 1/(1 – c + ct – u.z). You are right to point out that this multiplier is 8 with the assumptions in your numerical example. This is very high because the assumed expenditures on the JG scheme are high and would offset a large proportion of any changes in autonomous expenditures. With this multiplier, Yb in your numerical example should converge to 704, not just 176. Let me set out the derivation of the multiplier with only slight modifications to your equations (1) – (5). I think this is essentially the same economy as that in your post. where c’ = consumption resulting from Yg as a faction of Yg. For simplicity let us assume that c’ = 1. NB: G is spending on goods and services bought from the main non-JG economy, i.e. G excludes Yg. Note this discussion does not depend on the social value of any goods and services produced by JG workers. As an aside, I doubt JG production could be worth as much as Yg unless the scheme is extremely well run. I’m sure it won’t come as a surprise that I think the post is correct, but, hey, errors have been attributable to me in the past! Even if the post is correct, your contribution has been worthwhile, because it has required some of the reasoning in the post to be spelled out in a little more depth. Your reasoning seems to assume that Gg (govt expenditure on the JG scheme) is unchanged when A changes. Actually, no, this is not the case. The main focus of the post was precisely on the feedback between the broader economy and the JG sector with a view to finding the levels to which Gg and therefore G converge, given values of the various parameters and exogenous variables. Expression (11) shows that an exogenous change in A will have a multiplied effect on Gg. Since it is true for Gg, it is true also for G in expression (12). These two expressions were the focal point of the post. Everything before it was leading to these two expressions and everything after was either considering implications or explaining in various intuitive ways why the expressions are what they are. 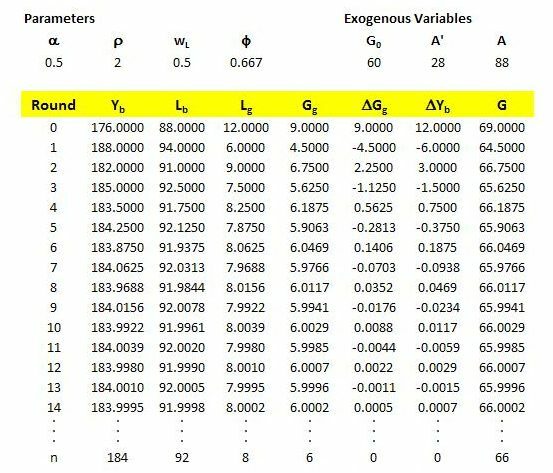 For example, the table presented in the illustration of convergence shows that, once values for the parameters and exogenous variables (including A) are specified, Gg oscillates in a damped manner around the level to which it converges. The oscillation is due to the feedback between the two sectors of the economy. With A and other exogenous values set, a particular level of output would tend to be the result except that the JG spending then adds more spending in response to demand for JG positions. This JG spending then adds to demand and employment in the broader economy, causing a contraction in the JG sector. But then the resulting contraction in JG spending causes a contraction in the broader economy and a resurgence of demand for JG positions and an increase in JG spending. And so on, back and forth, but with the feedback effects getting smaller each round of the process. If A were exogenously changed, this would alter the level to which Gg converges, and Gg would then oscillate around this new level. The relationship between A and the level to which Gg converges is actually very simple, once all the other exogenous values have been specified. In the numerical example, expression (11) reduces to Gg = 50 – 0.5A. An exogenous increase in A causes a reduction in the level to which Gg eventually converges, after oscillation. Sometimes a plausibility check can be helpful when considering a numerical example. I would suggest that it is implausible for the level of convergence of Yb to be 704 rather than 184 (as in the post). Consider, first, that if there were no job guarantee, Yb would converge to 176 (= A/alpha). Second, with the job guarantee in place, Gg in the first part of the example is only about 3 percent of total income (= 6/188). So, the possibility that this spending of 6 could cause Yb to increase from 176 to 704 is highly unlikely. The impact of JG spending on Yb is actually smaller – not larger – than autonomous spending. The reason for this is that a fraction (the wage share in costs) of JG spending initially enters the JG sector. Some leaks to taxes and saving. The rest is spent in the broader economy and only this part of JG spending has a multiplier effect on Yb. Perhaps in the post I should have also presented equations for Y and Yb that were free of G and Gg. This can be done, but it was not really the focus of the post, and the expressions are not really any simpler than those presented in the post. Also, what is happening to Gg and G is hidden when this is done. Personally, I find it more convenient to establish the value of Gg and hence G (by simply adding G0 to Gg) and then plug these values in to the formulas for Y and Yb and other variables. But, for the sake of completeness, here are formulas for Y and Yb that are free of G and Gg. Yes, I made a couple of silly blunders. Apologies. No worries at all. Thanks again for your input. It certainly got me thinking. Further to the above discussion. It is certainly valid to consider Gg endogenous with respect to income such that – as Kingsley suggested – its influence registers in the expression for the multiplier applied to A rather than being treated as a separate component of spending with its own multiplier. I think Kingsley is being overly critical of himself in his most recent comment. His basic point is sound. The reason I took the approach of treating Gg as a separate spending component with its own multiplier is because, in my view, Gg is more appropriately considered endogenous with respect to employment outcomes and variations in labor-force participation rather than with respect to income. It is true that Gg is indirectly connected to changes in income, and so can legitimately be treated as endogenous to the circular flow of income. But it seems to me that, in reality, variations in Gg will be in direct response to the difference between LF and Lb, rather than in direct response to income variations. It is possible (in fact quite likely) for Gg not to change when Yb changes, or to change in the same direction as Yb rather than the opposite direction. As an example of the first possibility, Yb might increase through a higher utilization of capacity, with no change in productivity, thereby resulting in higher employment in the broader economy but not necessarily any change in the number of workers employed in the sector or any change in job-guarantee employment and Gg. As an example of the second possibility, an exogenous increase in LF caused by an increase in labor-force participation might cause an exogenous rise in Gg due to expansion of the JG sector, which then causes an expansion of output and employment in the broader economy due to the multiplier impact of the extra (exogenous) JG spending. 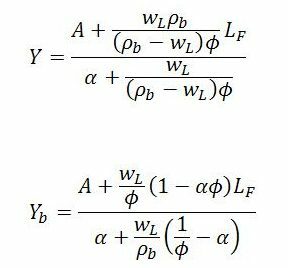 Here, the multiplier associated with a change in A with respect to total income Y is the reciprocal of the denominator of the first expression, and the corresponding multiplier with respect to Yb is the reciprocal of the denominator of the second expression. The first multiplier equals 1; the second equals 1.33. Using these multipliers gives the same answers as in the second part of the post’s numerical example. In the example, A was increased by 6. Using the multipliers 1 and 1.33 as appropriate, the ultimate impact of the change in A on Y will be 1 x 6 = 6, and the ultimate impact of the change in A on Yb will be 1.33 x 6 = 8. These are the same answers as in the post. However, in the post, the overall multiplier effects are decomposed into an effect due to the change in A and an effect due to the change in Gg, where Gg, though treated as endogenous with respect to employment outcomes, is treated as exogenous to the circular flow of income. The multiplier linked to A is then 2 for both Y and Yb. The multiplier linked to Gg is 1.33 for Yb and 2 for Y. So, in the example, when A changes by 6, this has a multiplier effect of 2 x 6 = 12 for Y. But at the same time, Gg responds to the change in demand for job-guarantee employment, and as a consequence contracts by 3. So its multiplier impact on Y is 2 x (-3) = -6. Summing the two effects gives 6, as expected. In the broader economy, the change in A has a multiplier impact on Yb of 2 x 6 = 12. The change in Gg has a multiplier effect of 1.33 x (-3) = -4. Summing the two effects gives 8, again as expected. But there is no necessity to follow my preference in the treatment of Gg. If it is considered preferable to treat Gg as endogenous with respect to income, the above expressions for Y and Yb can be used. Thanks also for raising the important subject of this post. I am not aware of any previous rigorous analysis. Moreover, thanks for recognising my main point that JG costs can be treated as an endogenous variable. I prefer this “endogenous JG” approach because to my mind it is easier to understand and gives simpler results. However, this is just me, not a criticism of your methodology. The following tries to advance the analysis by incorporating several important features, including some of the points in your last comment. Hopefully there are no more blunders here. – A short-run relationship between unemployment and output: “Okun’s Law”. This allows for short term changes in productivity associated with output changes, and for your point that there may be changes in average hours per worker, e.g. due to short-time and overtime working. – An explicit exogenous variable for the size of the labour force. This allows for immigration, emigration and your point about labour force participation rates. – A consumption function which focuses on “marginal” workers – those whose employment or unemployment in the main economy depends on output levels. Their marginal propensity to consume may be higher than for consumers as a whole. “Okun’s Law” is a short-term relationship between unemployment and output which allows for associated changes in average hours worked (e.g. short-time and overtime working) and changes in average output per hour worked (productivity) associated with output changes. or labour force participation rates. and that the average wage per employed person is unchanged. In this case consumption is perfectly stable irrespective of Eb or Yb.